Hazelburn 12 Year Old Single Malt ($90) – The Hazelburn brand is for the non-peated offerings from the Springbank distillery. Aromas of cereal, vanilla and plum, with similar tastes of cereal, vanilla, red delicious apple and pear. Also, notes of white grape, ginger, white pepper, black pepper and green pepper. The finish is mild leathery wood and mild pepper. A solid whisky, but overpriced. Kilkerran Work-in-Progress #6 Sherry Wood Single Malt ($60)– This is a 10 Year Old work-in-progress offering from Glengyle distillery, which will culminate in a 12 Year Old offering in 2016. A fruity nose of cherry and plum with cereal and vanilla that precedes similar tastes of mild peat, plum, cherry, apple and cereal along with spices of ginger, white pepper, black pepper and a mild barnyard note. The finish is peppery and leathery with notes of vanilla, charred oak and bitter honey. Another good whisky that shows promise for the eventual production offering, but I think I’ll wait for the final product. Springbank 10 Year Old Single Malt ($50) – Springbank offerings are mildly peated and this one is matured for 10 years in ex-bourbon and ex-sherry casks. The nose brings cereal, mild peat, apple and pear, while the palate senses cereal, vanilla, ginger, apple, pear, nutmeg and honey before a spicy and leathery finish. Springbanks youngest age-stated whisky is well balanced and offers a rounded flavor with mild peat. I highly recommend it as an introduction to the Campbeltown style of Scotch whisky. Springbank Green 12 Year Old Single Malt ($95) – This is an atypical Springbank offering with lightly fruity nose (mostly pear and apple) amidst a bit of smoke, vanilla and honey. I taste white grape, peach, pear, mild peat, ginger, honey, pepper, cigar box and detect a spicy, fruity, leathery and long finish with lingering light fruity notes. Each drop of water seemed to reveal new flavors, indicating a complex whisky that needs more exploration. I’m glad that I have a bottle of this at home and would recommend it over the Hazelburn 12 Year Old if you can handle a bit of peat. 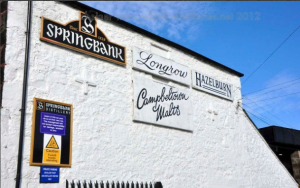 Springbank 18 Year Old Single Malt ($140) – An inviting nose of cereal, vanilla, plum, apple and cherry precede a palate of cereal, vanilla, plum, cherry, pear, apple, ginger and cigar box followed by a finish of charred oak and leather with spice and dried fruit. Lots of flavor here and a long finish with great balance across the board. This is just as good as I remember and an exciting whiskey that I highly recommend even at the moderately price premium. Springbank 17 Year Old Single Cask Fresh Sherry Single Malt 1997 ($160) – A rare Springbank offering with a fantastic nose of raisin, plum, molasses, cereal and a mild farminess and an equally fantastic montage on the palate of plum, raisin, ginger, pepper and almond. Other notes of tropical fruits and nuts. It’s a bold whisky with great balance and lots of flavor that develops will with the addition of water. Easily the winner of the night and an outstanding whisky! I hope I can find a bottle! Longrow 18 Year Old Single Malt ($180) – Essentially, a peated Springbank 18 Year Old, the nose is peaty with nuts, cherries, raisins and plums. The taste is mildly farmy with honey, mild smoke, tobacco, raisin and plum developing into an oily, farmy, briny, fruity and very long finish. It’s good, but not great and probably my greatest disappointment of the night as I was expecting much more. Afterwards, everyone at our table took turns buying mystery whiskies for each to take a guess at. Here’s what we tried: Bruichladdich Port Charlotte Islay Barley, Compass Box The Peat Monster, Ardbeg Galileo, Bowmore 15 Year Old, Lagavulin 16 Year Old, Glenfarclas 17 Year Old, Isle of Jura 16 Year Old and Ardbeg Corryvrecken. All of them were good and there were only 2 correct guesses, although it was fun making an attempt to hone in on the answer and we learned a lot in the process. In fact, our group decided to do a formal blind single malt tasting at a later date. Posted in Whiskey. Tagged Ardbeg, Bowmore, Bruichladdich, Campbeltown, Compass Box, Glenfarclas, Glengyle, Islands, Islay, Jura, Lagavulin, Speyside, Springbank. The best pour of the night was the 30 Year Old, followed by Loki and the 25 Year Old. Also, worth noting is that the 12 Year Old is quite good for the price and both the 15 and 18 Year Old are not good at all… even The Black Grouse was more enjoyable than these. As a bonus, I came away with a Highland Park ball cap and an unusual glass. Posted in Whiskey. Tagged Blended Malt, Highland Park, Islands, Single Malt. The nose is a rich blend of caramel, vanilla, orange and sweet pepper. There’s only a hint of smoke in the background and it took me a while to notice it along with a bit of salty air. The aroma is very nice and young, with little evidence of wood. The taste is slow coming with an initial saltiness followed by a lull before salty vanilla and orange mixture arrives. The finish is mildly sweet, noticeably salty then mildly leathery and peppery. The salty vanilla flavor persists for a while… long after the peppery finish transitions to a salty, buttery leather. Upon further tasting, I notice a buttery fir taste midway through and the leathery flavor becomes more of juniper. The sweetness is very pleasant and the salty, peppery, botanical quality complements it very well while the slight woody bitterness is nicely balanced. Also, I can’t forget to mention the bright citrus aspect. This is a nice whisky! A blended malt, Poit Dhubh is a mellow, lightly peated whisky that comprises mostly of Talisker, which reflects the fact its parent company, Pràban, is based on the Isle of Skye. The remainder of the blend is composed of various Speyside malts which imparts [?] and matured partly in sherry casks which lends it [the] typically rich flavours you would expect. Poit Dhubh [is] pronounced “potch ghoo” and means “black pot”, which is the gaelic term for an “illicit still”. Posted in Whiskey. Tagged Islands, Poit Dhubh, Single Malt. I’m a day behind again. Here’s yesterday’s dram. The nose is a soft note of seawater and smoke with caramel, grass and vanilla. The taste is very salty throughout with a lead-in of bitter orange, vanilla and ginger, followed up by white pepper, vanilla and more ginger. The finish is mildly leathery smoke and oak, with plenty of pepper. This is the saltiest whisky I’ve had and it seems to enhance the spicy aspects. The sweetness is mild, but it could use a bit more to provide balance. The smoke is most noticeable after the salt and pepper fade. 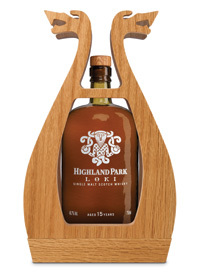 Highland Park has come highly recommended, but I’m not too impressed with this one. A beautiful single cask Highland Park distilled on the 5th March 1992 and aged in cask 1233 before bottling by Montgomerie’s in June of 2007. Posted in Whiskey. Tagged Highland Park, Islands, Montgomerie's, Single Malt. 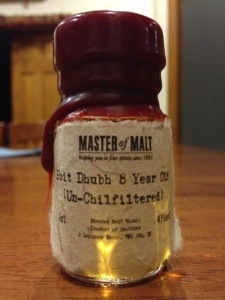 This is yesterday’s dram… one more and I’m caught up! This is also my first Island malt… here I go! Wow! Lots of smoke rising from this baby. I also smell seawater soaked peat with vanilla and caramel trying to break through. After letting it breath a bit, lemon drops appear as the smoke dissipates lightly. There’s still a bold peaty fragrance. The taste is notably salty, peppery and sweet with the peppery finish lasting 40-40 seconds leaving behind smoke, peat and oak. The last thing to go is the smoky peat, but its not overpowering anywhere along the way. 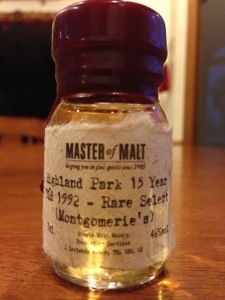 Back to the initial taste… there’s plum, ginger, tart apple and, of course, the salty, peaty smoke and pepper. The body of this whisky is full and flavorful… nothing seems particularly out of balance, but there’s a bit of something missing that I can’t quite put my finger on. Still, my first Island experience is a good one. Posted in Whiskey. 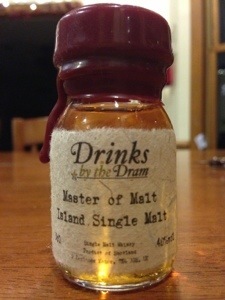 Tagged Islands, Master of Malt, Single Malt.